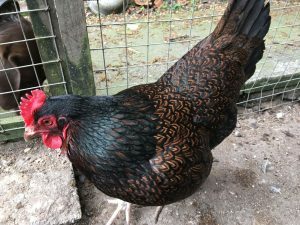 Meet our hens: a small flock of traditional breeds. Scroll down for some useful and interesting eggs facts. 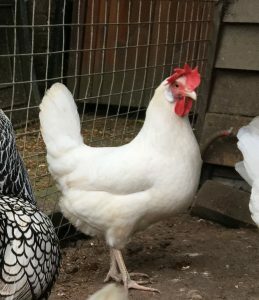 White Leghorn: these are small birds and lay remarkably large white eggs for their size. Commonly used for commercial production in the USA where consumers prefer white eggs. We have two mums and their three daughters, all laying. They are very friendly. 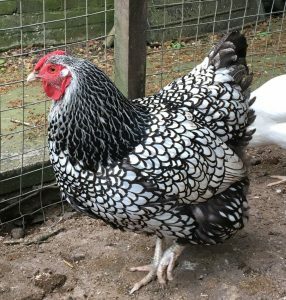 Barnevelder: very pretty markings, similar to a pheasant. These are large birds and lay rich brown eggs. Unfortunately they are not as productive as the Leghorns. Our Barnvelders are so docile you have to push them out of the way when you walk into the pen. 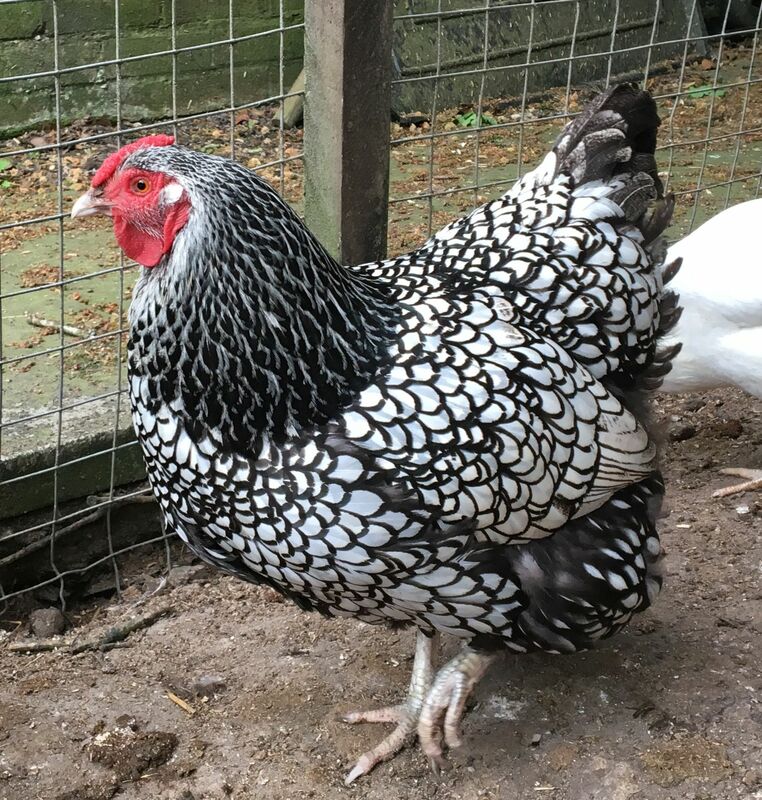 Lacy Wyandotte: also very pretty, and lay light creamy coloured eggs. Another traditional breed that is not very productive, and only get away with it because they are so decorative. They are more skittish than the Barnvelders, that’s just the way they are. Warren: two recent additions, these are in fact a hybrid based on the Rhode Island Red. They are great egg-layers and a lot more reliable than the Wyandotte or Barnvelder. Use the freshest eggs for poaching, they hold their shape well. Use older eggs for boiling, they will be easier to peel. If you want to use hard boiled eggs cold, plunge them into cold water to cool rapidly after boiling. This reduces the risk of the egg developing an unsightly (but harmless) grey ring around the yolk. You don’t need to keep eggs in the refrigerator. Fresh eggs keep for at least three weeks at room temperature from date of laying. Possibly more – see tip below! You can check eggs for freshness by putting them in a bowl of water. The older they are, the more they will float because the air sac in the egg gets bigger with age. In the USA, eggs are washed before sale, which significantly reduces shelf-life because the shell is slightly porous and the washing process actually pushes bacteria into the shell. In the UK, eggs are not washed which prolongs shelf life but unfortunately does not guarantee they are 100% clean. Always wash your hands after handling raw eggs in their shells regardless of where you buy them. When using eggs for cooking, break them into a separate bowl and individually check that they are fresh before adding to your cooking. There is nothing more annoying than breaking a bad egg into your prepared cake mix! A hen will lay fertile eggs for about 14 days after she has been a bit naughty with a cockerel. We don’t have cockerels so our eggs are not fertile. You can tell if a hen is laying, the comb and wattles are bright red. Hens only lay eggs when there is more that 14 hours of daylight. We con them by providing artificial light when the days are shorter. 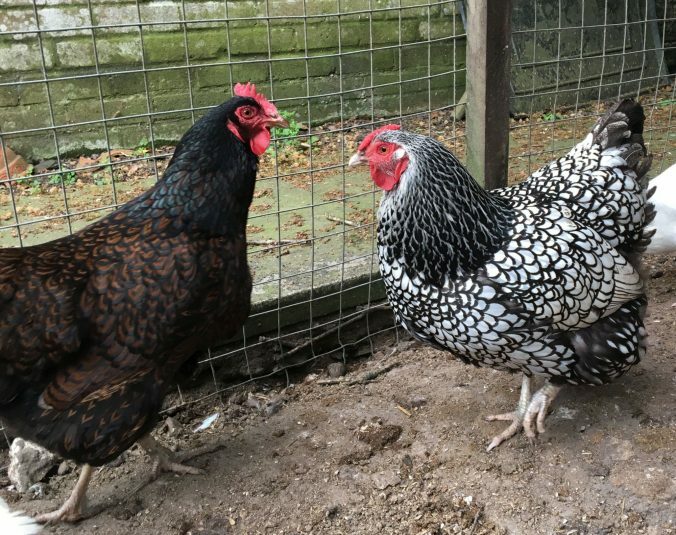 A good laying hen will produce over 300 eggs a year. Young hens produce standard sized eggs. As they get older, they lay fewer but larger eggs. I hope you enjoy our eggs. You can’t beat fresh for flavour!